This past weekend we hosted 10th Planet Black Belt John Botello for a seminar at 10th Planet Fairfield. John is a black belt under Eddie Bravo, owner/head instructor of 10th Planet Phoenix, and instructor to our moonhead Pat Campagnola. John started training in 2001 under Relson Gracie while in the Navy stationed in Pearl Harbor, Hawaii. After moving to California he spent time training with Rickson Gracie and Fabio Santos, who he earned his blue belt from. Around that time, John heard about Eddie Bravo from a friend and made the full time switch to training no gi. After leaving the Navy in 2006 he decided to settle in Arizona and received his purple belt while training at Sitan Gym in Chandler, AZ. In early 2007 John got certified to teach the 10th Planet Jiu Jitsu system and became Eddie Bravo’s first 10th Planet affiliate school. 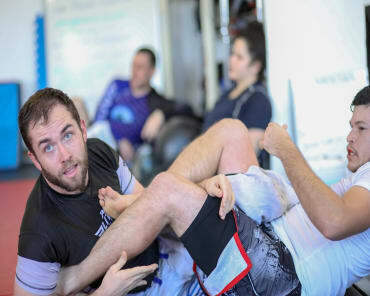 He continued to grow his school and his skill over the years, eventually earning his black belt from Eddie Bravo in 2014. The seminar was well attended with students from several academies, and John blew some minds with two hours of advanced rubber guard followed up by an in-depth Q&A. We went deep down some rubber guard paths and the terminology garnered some laughs from those not fluent in the 10th Planet language. Mission control, zombie, New York crackhead, chill dog, invisible crackhead, and the list goes on and on. We are grateful to have a great relationship with a true master of the 10th Planet system and look forward to another seminar in the future, after the snow comes and goes, of course.